So we must firstly install a CA on each environment (assuming that you will not be using a public CA) and import the root CA certificates of each environment into the other using the Certifcates snapin - place the root certificates under “Trusted Root Certificates” on the computer account. You must also double click on the certificate afterwords and make sure “SMTP” is ticked under the “Services” tab! Once the certificates have been installed we will actually hook the two exchange servers on the two sites together. 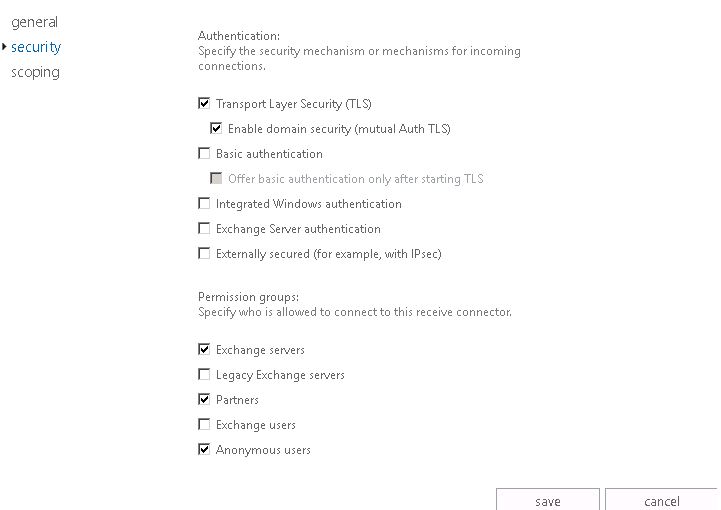 We will select “external secured” - and finally adding an "Address Space" - which simply defines which domains should this send connector be used for. Now we add a receive connector on the other server, selecting the "Custom" type, specifying the source server etc. We will then go into the new connectors properties and make sure we select “external secured” and "Anonymous Users" check boxes. It is also vital that there are DNS entries present for the partner exchange server it each environments! Now we will check and make sure that the message has been sent successfully via querying the Queue Viewer and once we have confirmed receipt we can add our domain security by using TLS. Set-TransportConfig –TLSReceiveDomainSecureList domainb.com // so anyone sending to domaina.com from domainb.com should use TLS. We need to modify the send connector we created for domainb.com on domaina.com: and make sure “Proxy through client access server” is checked. We now need to perform the inverse operation on domainb.com now - I won’t cover this as I have listed all of the procedures above.